"Don't drive me crazy before you move in, will ya?" 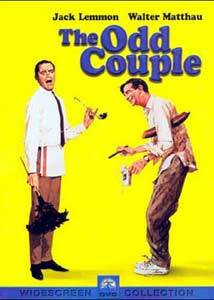 The film version of Neil Simon's hit play The Odd Couple nowadays starts off with a couple of strikes against it. First off, the novelty of divorce has disappeared from society making the angst largely seem ridiculous. Second, the film has to compete with a decade-long run of a hit television show based upon it and its truly perfect cast. Third, because the characters and the situation are now so familiar to television viewers from the long run and syndication, the film seems to take forever to get to the point. As such, we hardly need to give a synopsis. Insufferable hypochondriac Felix Unger (Jack Lemmon) has been thrown out by his wife, and turns to his poker-playing friends at the apartment of divorced Oscar Madison (Walter Matthau). Seeing Felix's plight, Oscar invites him to share the apartment, but he is soon driven nuts by Felix and his neatnik ways, while Felix is outraged at Oscar's completely intolerable sloppiness. The comedy comes from the situation of the completely opposite characters and their attempts to survive together without killing each other. The usually reliable Jack Lemmon is surprisingly ineffective as Felix Unger; part of the problem is that he's judged in light of Tony Randall's impeccable interpretation of the part as an obnoxious whiny prig. By comparison, Lemmon seems to be just going through the motions. The scene in which he makes bizarre honking noises in a restaurant in an effort to clear his sinuses seems forced and improbable. Matthau does his usually fine comic slow burn and nasty curmudgeon and plays off Lemmon quite well. I did appreciate the fine supporting cast of poker players and the Chelsea girls who come on a disastrous dinner date with Felix and Oscar. While much of the film is still quite funny (notably the poker game set piece with the humor revolving around Oscar's broken refrigerator—"I got green sandwiches and I got brown sandwiches." "What's the green sandwich?" "It's either very new cheese or very old meat. "), the opening is depressing and morbid and seems to take forever to get to the comedy. Since it's clear that there was a rich vein of comedy to be mined from the basic situation of the diametrically opposed roommates, it's disappointing that the film takes over a third of its running time to get to the situation; as we saw, it could have been dispensed with by a voiceover of two or three sentences. The fact that most marriages now end in divorce makes the film seem very dated in the reactions that everyone has to Felix's failed marriage; even though a particular situation might still be personally devastating, it's no longer a big deal or surprising in the big picture of things. Another problem with The Odd Couple is that much of the time it very much feels like a filmed stage play. The poker table is set up unnaturally to have the players sitting in an arc around a table instead of all the way around. We get a few exteriors, but much of the time is spent in the apartment. There is little camera movement to lend variety to the shots. This gives the film a lethargic feeling that exacerbates the slow opening. Fans of the television series who've not seen the original are likely to be disappointed. Although there's not much objectionable language, some of the humor is rather racy for a 'G' rating; if it were submitted to the MPAA today it would probably get a 'PG' at minimum. Image Transfer Review: Paramount's anamorphic transfer looks great. Blacks are excellent and colors are outstanding, without fading or distortion. The early scenes of Felix wandering depressed through the city are suitably dark but plenty of detail is still visible. No artifacting was visible and the picture is clean and crisp. No frame damage, speckles or dirt of any kind was present. I must sound like a broken record on my reviews of Paramount discs, but this studio consistently does a wonderful transfer of its catalog titles. Another well-deserved 'A' rating. Audio Transfer Review: The sound on the 5.1 remix is surprisingly full and rich, though slightly compressed-sounding. Neal ('Batman') Hefti's classic score sounds great, with its full range displayed nicely. Dialogue is almost entirely limited to the center channel. There is some mild directionality; one door slam is so far directional that it sounds out of place alongside the rest of the audio track. The surrounds are primarily used for background music and crowd noises in the brief ballpark scene. The English mono track sounds nearly as good as the 5.1 remix, although it tends to emphasize the higher frequencies of the score and sounds a little tinny in comparison. Dialogue is clear on both versions and does not suffer on the English mono track. The French mono track is quite bad; it sounds as if it was recorded in an echo chamber and contains significant noise. Sorry, mes amis. Extras Review: Not much to speak of. We do get a dirty print of the original theatrical trailer, presented in 2.35:1 anamorphic widescreen, and the English subtitles are an easily readable yellow. Chaptering is inadequate, with many chapters running on far too long. A somewhat dated film with a slow opening, but still a fine comedy, given a sparkling new transfer. This disc is short on extras, but is worth a rental nonetheless.